Flagstaff has one of the longest remaining stretches of Historic Route 66 that remains open and drivable. American and European tourists flock to Flagstaff to experience the Mother road for themselves. Route 66 is a uniquely American experience and in Flagstaff we have the main line of the BNSF railroad paralleling Route 66 right through the center of town! Flagstaff has a vibrant downtown that hosts many festivals and car shows. First Friday Art Walks showcase many downtown galleries and boutiques. The movies in the square series, holiday parades and NAU homecoming give Flagstaff an exciting, timeless, traditional feeling. The Coconino National Forest is 1.9 million acres of Ponderosa Pines, Pinion and Juniper trees that is located in North Central Arizona. The city of Flagstaff is surrounded by Coconino National Forest so Flagstaff does not have the urban sprawl that surrounds most cities. The forest lands are enjoyed by residents and visitors. Camping, hunting and fishing are prevalent. 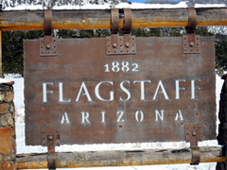 Flagstaff often plays host to visitors from Phoenix who consider Flagstaff their 'backyard'. Phoenicians come to Flagstaff to ski in the winter, and to cool off in the summer. This high altitude desert forest features The San Francisco Wilderness Area and reaches all the way to the Grand Canyon. The Burlington Santa Fe Railroad is the main railroad line through the Southwest United States and to the ports of Los Angeles and Long Beach on California’s Pacific coast. The BNSF line runs right through the middle of Flagstaff’s downtown, adding a low rumbling pulse of excitement to the city. BNSF is a major job producer and tax payer in Coconino County. If you like trains, Flagstaff is a great place to be. Many restaurants have views of the trains which are fun and relaxing to watch. Double stacked box cars, coils of rolled steel, construction and military equipment all ride the rails. From above, Flagstaff looks like an old time train set with the town set up around the path of the rails. Northern Arizona University brings youth and vitality to Flagstaff. Programs feature forestry and education majors. The National Football Leagues’ Arizona Cardinals have training camp at Northern Arizona University every fall and fans come by the thousands to cheer on their favorite players. Flagstaff is fortunate to have a unique view of the heavens. We are surrounded by miles of darkness in all directions and we are at 7000 feet of altitude. This means that when you view the heavens from Flagstaff you have 7000’ less atmosphere to look through. Perceval Lowell believed Flagstaff to be such a great viewing spot that he founded an observatory here. Perceval Lowell had the historic Clark Telescope shipped to Flagstaff, and over 100 years later visitors to the observatory can still view the heavens through this original instrument! Recently the Lowell Observatory has joined with the Discovery Channel on a near earth object telescope near Flagstaff. The Lowell Observatory and Discovery Channel collaboration along with the US navel observatory near Flagstaff add a scientific and intellectual component to Flagstaff that is rarely seen in a city of this size. The city of Flagstaff is located on a plateau south of the San Francisco peaks which are the highest point in Arizona, over 12,000 feet! San Francisco Peaks Area are home to Flagstaff’s primary snow recreation facility known as Arizona Snowbowl. Snowbowl resort attracts skiers from all over the west but primarily from Phoenix. This winter recreation tourism is an excellent economic driver for Flagstaff. This traffic fills hotels, bars and restaurants with clients who consider Flagstaff their back yard. Snowbowl is expanding and adding snow making capability which will allow the resort to provide an excellent skiing experience even in dry years. The Nordic Center provides miles of trails for cross country skiing. The city of Flagstaff has recently designated a parcel on Cedar Hill for a much needed snow play area. Flagstaff’s water system is supplied by wells that tap local aquifers at about 2500’ of depth. The result is extremely clean, pure, fresh water that the city of Flagstaff delivers by pipe to my house and it couldn’t be better. When I travel I always can’t wait to get home to my super water supply. Flagstaff gets over 300 days of sunshine a year. Sunshine is a great way to lift your feeling of well being and improve your attitude and your health. Coconino County has some of the cleanest air in the United States according to federal government studies. Not only is Flagstaffs air clean, it is pine scented due to Coconino National Forest, the world’s largest Ponderosa Pine forest. Sedona, Arizona is a 45 minute drive from Flagstaff. The drive from Flagstaff to Sedona on Route 89A through Oak Creek Canyon has been named one of America’s most scenic highways. This jaw dropping ride starts in the Ponderosa Pines and through a series of switchbacks and hair pin turns ends up next to Oak Creek surrounded by natural monuments made of iron rich 'red rock' sandstone that will leave you feeling like you are on another planet. Sedona is some 2000’ of elevation lower than Flagstaff. Sedona is typically 15 degrees warmer than Flagstaff, it is great for Flagstaff residents to hike and golf in Sedona in the late fall, winter and early spring. In the summer Flagstaff is the host city for folks from all over the deserts of Arizona and California looking for relief from the desert heat. Flagstaff is the County seat of Coconino County. Coconino County is Americas largest county by land area. Coconino County employees estimate they administer 75,000 to 80,000 taxable parcels of land. All of that tax money plus all City of Flagstaff taxes flow through this small city of 65,000 permanent residents. Add to this revenues produced directly and indirectly by Northern Arizona University and Lowell Observatory along with W.L. Gore and Associates and all of a sudden you see why Flagstaff is not the sleepy little town it first appears to be. Within a four hour drive of Flagstaff you can visit; the glits and glamour of Fabulous Las Vegas, Nevada. You could visit one of the eight wonders of the world the spectacular Grand Canyon. You could hike the scenic red rock country of Sedona. You could tour the Petrified Forest with its 230 million year old trees that have turned to stone. You could take the sky lift to 12,000’, the top of the San Francisco Peaks. You can go to Phoenix for golf, spring training baseball, Major League Baseball with the Arizona Diamondbacks, NBA Basketball with the Phoenix Suns, NHL Hockey with the Phoenix Coyotes and much, much more. You could visit Meteor Crater, one of the worlds best preserved meteor impact sites. You could go to Sunset Crater and visit lava flows and cinder cones from when this area was volcanically active. You can see Wapatkie National Monument, home of an ancient Indian civilization. You can spend time exploring some of the old Route 66 towns like Winslow, Williams, Ash Fork and Kingman. If you like day trips you will love Flagstaff.